(a) Epiphytes: These algae grow on the surface of other plants. (b) Endophytes: These algae live inside the other plants. (c) Phytoplankton: The free floating algae are phytoplankton. 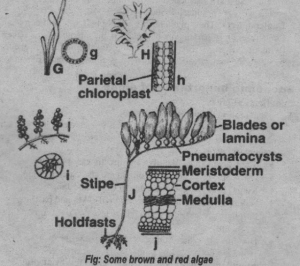 (d) Sessile: Some algae are attached to the substratum by holdfast. I. Unicellular: These may be motile or non-motile. 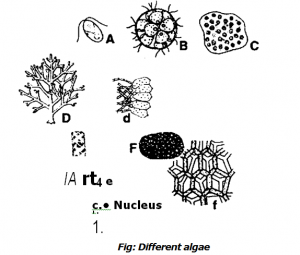 Colonial form: Some algae are multicellular colonial. The cells are held together by a mucilaginous matrix. It forms colonies of different shapes. Some colonies have definite number of cells. Such colonies are called coenobia. (a) Heterotrichous: The filament with prostate (horizontal) and vertical system are called heterotrichous. (b) Pseudoparenchymatous: Sometimes, filaments are loosely grouped to from pseudoparenchymatous body. (c) Coenocytic: The filaments without cross walls are called coenocytic filaments. Cell wall: Cell is surrounded by definite cell wall. Cell wall is chiefly composed of cellulose. Cytoplasm: Cytoplasm has different membranous organelles. These organelles are plastids, mitochondria, ribosomes and endoplasmic reticulum. Some motile forms have eye spots. It is sensitive to light. Motile forms have one or more contractile vacuole. Nucleus: Nucleus is embedded in cytoplasm. It has central or peripheral position. Nucleus is composed of chromosomes, nucleoplasm and nucleolus. algae. Chlorophyll b is present in Chlorophyta and Eugenophyta. Chlorophyll c is present in Bacillariophyta, Chrysophyta etc. Chlorophyll d is present only in Rhodophyta. (c) Phycobilins: These are phycocyanin (blue) and phycoerythrin (red). (a) Carbohydrates: The carbohydrate reserve food materials in algae are starch, floridean starch and myxophycean starch. Laminarin, paramylum and leucosin are also present in some algae. (b) Fats: Fats are also present in some algae. Sterols are also reserve food material in many algae. (c) Alcohol: Mannitol (polyhydroxy alcohol) is also a food reserve in some algae. Most of the uniCellular and reproductive cells have flagella. Their number may be two or four. There are two types of flagella: Acronematic with smooth surface and pentonematic with fine hairs. Each flagellum is composed of axial filaments called axonemes.. Axonemes are surrounded by sheath. Flagellum arises fron basal bodies. Basal bodies are connected with each other by transverse fibers called paradesmose. (a) Monophasic Haploid: It is a primit;Ne 1;fc cycle. lc ‘Ilk case, vegetative plant body remains haploid. Gametes are pri ,diced by mitosis Gametes fuse to form diploid zygote. First div ision in zygote is meiosis. It forms haploid vegetative body. Thus zygote is the only diploid stage in such cycles. (b) Monophasic diploid: It is more advanced life cycle. In this case, vegetative stage is diploid. Haploid gametes are formed by meiosis. These gametes fuse to form diploid zygote. Zygote divides by mitosis to form vegetative body. Thus all life form is diploid except gametes. (c) Diphasic life cycle: In this case, two types of generation are produced: gametophyte and sporophyte. Both generations alternates with each other. If both generations have similar vegetative structure, then they are called isomorphic. If they have different structures, then they are called heteromorphic. • Gametophyte is haploid generation. It produces gametes by mitosis. Gametes fuse to form diploid zygote. Zygote form diploid sporophyte. meiosis. Spores germinate to form gametophyte plant. types of s es are rsduced during asexual repttluotioas. Spores are prodUcecf by Ifie—division of protoplast dP–telfrefriihty°1are Produced inside the sporangium. Zoospores: Motile spores are called zoospores. They have flagella or cilia. They are produced in zoosporangium. Zoospores are produced in water. They are found in most of the algae. 2-16 ‘pores are produced in each cell. Aplanospores: The non-motile spores are called aplanospore. Hypnospores: In this case, cell secretes a thick wall and become rounded. It becomes hynospore. Akinetes: If the original wall of the cell becomes thick, it is called akinete. Pa I tuella : Sometimes, spores remains embedded in mucilaginous matrix. Thus a rounded body is formed with many spores. This condition is called Palmella stage. Sexual reproduction occurs under unfaVourable conditions. It produces a resting stage for passing unfavourable period. Gametes are produced during sexual reproduction. These gametes are prudence’ in gametangia. Gametes fuse to form zygote.. Zygote secrets4r ts– k wall awl become zygospore. Zygospore geimMates duri.ifFia.Voifrable conditions. There are different forms of smival reprocriiaionS in algae. I. Isoganny: In this case, gametes have similar size and form. Their fiSletriciealled isogamy. 2. Anisogamy: In this case, gametes have similar structures and form but different sizes. The smaller active gamete is called male gamete. The larger less active gamete is called female gamete. They fuse to for zygospore. Oogamy: In this case, the gametes have different forms and structures, sizes and behaviors. The small motile gamete is called antherozoid. They are produced in gametangia or antheridia. The non-motile larger gamete is called egg or oosphere. It is produced in oogonium. The male gamete swims in water. It enters into to oogonium. Fertilization occurs. The zygote secretes a thick wall and become oospore. Parthenogenesis: Sometimes, oosphere is changed into oosporc without fertilization. It forms parthenospore. This condition is called parthenogenesis. Rhodophyta (red algae): They contain red pigment phycoerythrin and blue pigment phycocyanin. Pyrenoids are present. Food reserve is floridean starch. Flagella are entirely absent. Sexual reproductive is oogamous. Special spores carpospores are produced in them. I. Source of food: Most of photosynthesis is carried out by fungi in fresh water and marine water. Therefore, they store a large amount of energy. Some green algae like ulva are directly eaten by man. Dried Spirogyra and oedogonium are also eaten by man. Kelps (Brown algae) are eaten in China and Japan. Chlorella is used in the preparation of cakes and pastries. Porphyra are eaten by man. These are also used in puddings and soups. Diatoms are major source of food for marine fishes. These fishes are consumed by human. An antibiotic chlorellin is obtained from Chlorella. It is affective against gram positive bacteria. Agar-agar is obtained from Gelidium. It is used a laxative. Chara plants are used to kill mosquito larvae. It is used in tooth and tooth pastes. It is used as fire proof material. It is used as absorbent in dynamites. Light weight bricks are prepared from it. These bricks are used for building fire proof houses. It is used as adhesive structure in artificial silk. It is used in ice creams. It is used in paints and many pharmaceutical products. It is used in processing of natural and synthetic rubbers. 5. Uses of gelatin: Gelatin is obtained from red algae. Gelatin is used as bases in shoe polishes, shaving creams, cosmetics, shampoos, glue, jellies, candles and tooth paste. I. Algae grow excessively along the shore of ponds and oceans. It makes the environment unhygienic. Algae cause algal bloom. Algae cover the upper surface of swimming pools. It produces foul smell. Algae damage the tea and other subtropical rain plants. Algae cause eutropMeation in ponds and lakes. It causes the death of many fishes due to oxygen deficiency. Some species of marine algae destroy the ships. This briefly discussed short note is very useful to all like me.Thanks to BIOLOGY BOOM.